Each villa includes a living/dining area, fully equipped kitchen, Master Suite with large soaking tub, three TVs, DVD player, and washer/dryer. Within driving distance to area attractions and sports facilities. Recreation, shopping, dining, and entertainment near by. 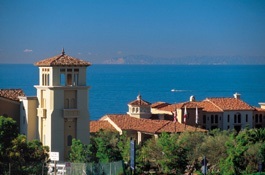 Access to Pelican Hill Golf Club’s two championship, 18-hole golf courses—both designed by Tom Fazio. Outdoor swimming pools with spas. Tennis courts available at the Newport Beach Marriott Hotel and Tennis Club.